What a treat I have for you today, book lovers! Allow me to introduce you to Ellen Booraem, and her wonderful (second) novel, Small Persons with Wings (they hate to be called fairies), from Penguin/Dial Books for Young Readers, 2011. My interest in middle grade fiction (loosely translated: stories for kids in grades 3-6 , or ages 9-11) often has me pilfering books off of my daughter’s nightstand. This book cover grabbed my interest immediately, and so did the story, which I read in two sittings. What Ms. Booraem has created here is basically the opposite of a cloyingly sweet fairy story. It does have wonderful elements of magical realism, but these fairies aren’t delicate. In fact, they are quite a rowdy bunch. Ellen graciously agreed to be interviewed about this story and her writing career. Read on! Nancy: How did your writing career begin? Ellen: I got my first writing job a year after I graduated from college—in fact, it was at my college, which hired me to write and edit alumnae publications. I produced publications for colleges and corporations over the next ten years, then moved to Maine and started in as a reporter and editor for weekly newspapers. 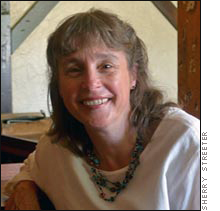 My last job—arts and special sections editor for the county weekly—was really my dream job, but I quit it at age 52 to write my first novel, The Unnameables. It was nuts—I’d written fiction on the side in my 20s and 30s, but for at least ten years I’d done nothing but my job. I’m incredibly lucky that it worked out. Nancy: In the beginning of Small Persons With Wings, Mellie Turpin discovers she has a Small Person (a fairy – but they hate to be called fairies) living with her. Are Mellie’s experiences based on events in your own life? Did you ever have an imaginary friend? Ellen: My imaginary friend was an alligator, useful mostly so I could berate people for stepping on him. Later on, though, my friend and I pretended that fairies lived in my front wall, and we decorated their houses with great care. One draft of SPWW described that wall as the Parvi’s home before they arrived in Mellie’s basement, but I ended up cutting that out. Mellie is a lot like me, except that I was skinny rather than plump. I was an only child more comfortable with adults than kids, and I did experience some bullying, although nothing as horrible as what Mellie’s classmates did to her. Nancy: The fairies (sorry, SPWW) in your story are far from Disney-esque. I love how irreverent they are! I’ve never read about fairies having a penchant for bourbon before. How did you come up with the idea for this particular set of Parvi Pennati? Ellen: After I quit my newspaper job, I replaced the newsroom camaraderie with an online private forum of Harry Potter fans. We did some silly role-playing, and I made up this hapless, overdressed fairy who lived in a pub chandelier. I loved her so much that I decided to write a book about her. The first image in my head was this poor disheveled lady sleeping in her chandelier with a nip bottle of bourbon beside her, surrounded by this decrepit pub. I started asking questions: Why is she alone in such an awful place? Why’s she such a mess? Why the bourbon? The book grew from the answers, some of which I found in Charlemagne legend. I modeled their culture on 18th century France because I wanted them to be as foppish as possible. Nancy: Mellie is the target of some bullying from her classmates. This has been an age-old problem. a) Why do you think it’s so much more prominent in our news now? Ellen: Seems to me everything gets more scrutiny nowadays, thanks to the electronic media and the internet. Where bullying is concerned, that’s all to the good. Incidents that used to be known only to a small group are now in everybody’s news feeds, and sunlight is the best disinfectant, as they say. The most important message to kids is to tell an adult what’s going on—I never did, and I think the girls who bullied me would have gotten some attention and some help if I had. b) Does your work with the Brooklin Youth Corps (a summertime self-esteem program for teenagers) specifically target anti-bullying topics? Can you tell us more about the BYCorps in general? Ellen: The BYC isn’t specifically targeted to bullying, although of course we’ve occasionally had to deal with it. My little town, Brooklin, had a problem with youthful vandalism in 1996, and it turned out the kids were on their own while their parents worked—they had nothing constructive to do all day. So the selectmen got a Community Development Block Grant to start the BYC. 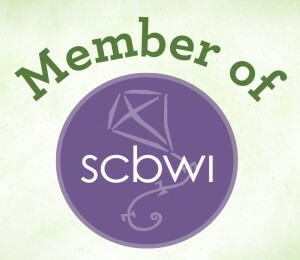 It’s run by a steering committee that I chair, with a hired coordinator in the summer. The program matches teens with homeowners who need chores done, transports and supervises them, and teaches them basic job skills like being on time, talking to a stranger, making eye contact, etc. We also tend a vegetable garden planted by school kids and sell the summertime harvest at a farmer’s market. The fall harvest goes into the school lunch program. (NT: Fun fact – Ellen lives and writes in the same small town in Maine where E.B. White lived when he wrote Charlotte’s Web). Nancy: Mellie is also obsessed with art history, Edgar Degas in particular. Did you ever think about putting a “photo spread” in the book? Or, would copyright red-tape have prohibited it? Ellen: I did suggest including photos in the book, but my editor preferred that I put that stuff on my web site. So I did. (It’s here.) I suspect we would have had copyright problems with museums if we’d tried to publish some of the art. I got the web site photos from Wikipedia’s creative commons, so I guess I’m okay. Nancy: What kinds of books did you enjoy reading as a child? Ellen: I liked mysteries and fantasies, mostly. I loved Greek myths, anything that offered a supernatural explanation for everyday objects and events. My all-time favorite book was The Daughters of the Stars by Mary Crary, an obscure novel published in England in 1939. The premise is that the heavens are run by a bureaucracy in which women hold most of the power, although sometimes only behind the scenes. The heroines are a ten(ish)-year-old girl and her mother, who is luminary of two continents and therefore very influential. They have adventures traveling across the sky and under the sea, and are quite capable of taking care of themselves. Nancy: What role, if any, has a critique group or partner played in your writing process? Ellen: I’ve been in a small, local critique group for seven or eight years, and it’s been hugely important. Not all the members are kidlit writers, or even fiction writers, but the feedback and the moral support have been a godsend. Nancy: Can you describe the process of finding the right agent for you? Ellen: I happen to live in an area that’s rife with creative types, so I pretty much used contacts. I think I sent only one cold query letter. I was rejected, I think, three times. Then an acquaintance sent my book to his agent at Janklow & Nesbit in New York, and the agent passed it along to Kate Schafer, a colleague of his who was just starting out as an agent after several years spent handling foreign rights. I was very lucky: Kate took me on, and I stayed with her when she left to start her own agency. She eventually got married (she’s now Kate Schafer Testerman) and moved to Denver—the distance has proved to be no problem at all, thanks to email and the internet. Her agency is ktliterary. Nancy: What are you working on now? Ellen: A third book, TEXTING THE UNDERWORLD, is due out next August, again with Penguin/Dial Books for Young Readers. One of the main characters is a banshee, so it’s essentially about death even though it’s funny. We’ll see how that goes over. I’m in the early stages of another book about a boy in the future who finds a junction between his world and an alternate past. Nobody his age knows how to read, and he meets a girl from the alternate 17th century who is desperately trying to learn. An alchemical pamphlet from her world endangers them both. Nancy: Do you have any advice for other writers? Ellen: The advice I wish I’d followed decades ago: No matter how busy you are, sit down and write a little every day, even if it’s just for half an hour. A page a day ends up as 365 pages when a year is out, and that’s a lot better than the nothing you’ve written if you keep not doing it. Thank you, Ellen, for your time and your insights. 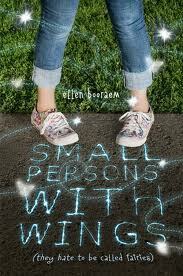 I hope you will all check out Small Persons with Wings, and that you (and your kids) enjoy it as much as I did. Nancy Tandon • This entry was posted in Author Interview, Middle Grade Fiction, Writing and tagged advice for writers, fantasy, middle grade fiction, Writing. Bookmark the permalink. Not only are you a children’s lit writer, but, apparently, you’re a closet journalist, too! Well done! I enjoyed this interview and love, especially, how Ellen used her own interests and background to add richness and authentic depth to her character. I agree, Laura. It’s a great example of the old adage: “everything you do informs your work”!